In 1992 Schooner Alert was launched and christened Tall Cotton, a southern expression that means Finest Kind. She was designed and built by Paul Rollins in York, Maine. In 2013 Alert was sold to Captains Perry Davis and Bethany McNelly-Davis. They converted the Alert from a commercial fishing schooner to a commercial passenger carrying vessel. Schooner Adventure has been designated a National Historic Landmark and is a perfect example of the Gloucester fishing schooners of the period 1890 to 1926, known for racing to and from the Grand Banks, bringing fish to the East Coast markets as fresh as possible. The 88-foot schooner Wendameen was designed by John Alden, and built in East Boothbay, Maine to be launched in 1912. Inactive since the 1930s, she was thoroughly restored in the late 1980s and is now listed on the National Register of Historic Places. Wendameen is certified by the US Coast Guard to carry 48 passengers. Bagheera was designed by John Alden and built in 1924 in East Boothbay, Maine. Shortly after launching, she sailed in the Bermuda Race, and then spent the next 50 years sailing in the Great Lakes. 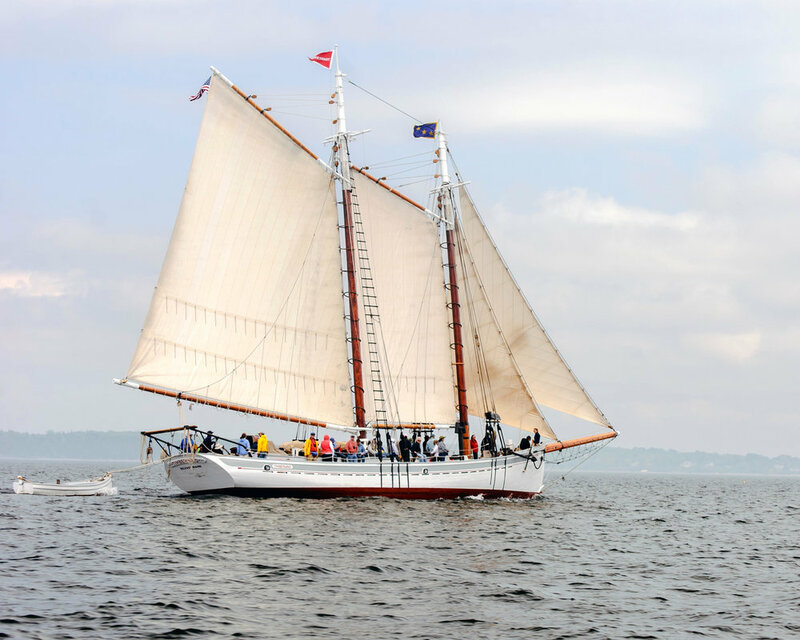 The vessel was then sailed extensively on both coasts of the Americas before being shipped to Maine in 2002 to the Portland Schooner Co.
Schooner Harvey Gamage has done more sail training than any other operating schooner in SchoonerFest since she was built in 1973. Built by and named after the Maine shipbuilding legend himself, the Gamage is now operated by Ocean Passages and offers 5 day sail training voyages for teens along the coast of Maine. Maine Maritime Museum’s newly restored 1906 schooner Mary E is the oldest surviving Maine-built fishing schooner. Purchased by the museum in late 2016 and restored on the grounds over the last year, Mary E is open daily for dockside tours through October at the museum in Bath.